NCH has a strong commitment to diversity, which makes it a fun place to work. We are a truly global organization where people have found friendships with respected colleagues across continents. 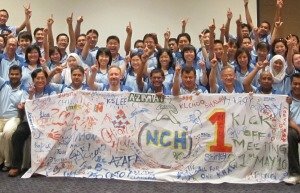 With a variety of backgrounds, strengths, and passions, NCH corporate associates help keep the business running. We have talented, team-oriented individuals who are motivated to get the job done. Recognizing the value of the individual, NCH supports and develops its associates to ensure that each individual has opportunities to grow. If you have a strong desire to join a company who will help you reach your professional goals, a corporate career with NCH may be right for you! Cleaning water, conserving energy and delivering maintenance solutions since 1919. National Disinfectant Company, the original incarnation of NCH Corporation, was founded in Dallas, Texas, by Milton P. Levy in 1919. Levy's three sons, Lester, Milton Jr., and Irvin, started working in the company warehouse and shipping areas as teenagers. Today, NCH distributes to more than 50 countries with an extensive and varied product line, and our outlook for growth in the market remains strong. The Leadership of the company remains in the hands of the Levy family, descendants of the founder, Milton P. Levy, Senior.